Feelif Farm game is an exciting interactive story, which will entertain you for hours. Farmer George has lost his animals. Please help him find the runaway animals by recognizing the animal sounds. Feelif Farm game is excellent for memory training and concentration. The rules are simple. The game places a number of farm animals randomly around the screen. The player is asked to find specific animals (sheep, cows, chickens, pigs, and horses). 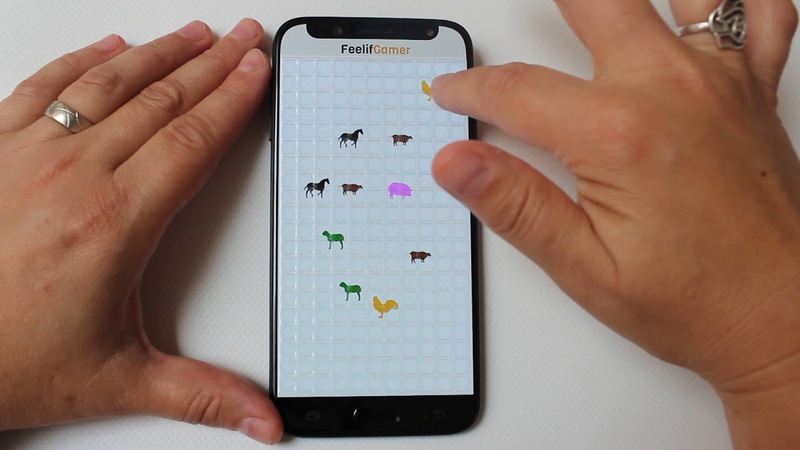 The player drags his finger around the screen to locate the animals; when his finger touches an animal, the corresponding animal sound is made, vibrations are felt, and a hum sound is heard. If the player has found the correct type of animal, he double taps on the animal. The player should be encouraged to remember the spatial location of the various animals so that he can quickly find a specific animal again when asked. All animals from Farmer George have run away. Help to find them. Feelif Farm game is an exciting interactive story which will entertain you for hours.